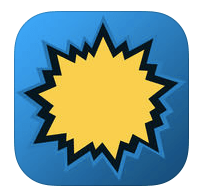 I checked out PowFolio (available on iTunes or Google Play), a free, ad-supported comic app. It lives up to its promise — you can read comics for free. My problem today, though, isn’t “I don’t have enough comics to read”. It’s “I have too many comics to read, so they better be worth my attention”, and these aren’t in that category. I don’t want to paint with too broad a brush, but most people aren’t paying attention to the publishers Antarctic Press, Arcana, Heroic, Keenspot, and Tidalwave. That’s why they’re willing to experiment with efforts like these. And those are the big names included. There are a few Image titles, including Avengelyne and Hoax Hunters. Most of the comics are also older, published in 2014 or earlier. In addition to the current comic section (labeled “Modern”), there’s a “Golden” section with lots of public domain works and a “Kids” area. Reading the comics wasn’t as smooth as I would like — every page or two, a “page loading” bar would interrupt the flow. (The ads always were visible, though.) The app is streaming-only, no downloads available. There’s a rating function and a chat room (which contained a Donald Trump reference and meaningless sound effects). I’m glad to know this app is out there, but the only time I’m focused on reading comics on my iPad is when I’m away from my wifi, so the streaming-only function is a dealbreaker for me, even beyond the fact that I’m not interested in most of this material.